So maybe safely guiding in airplanes from the comfort of a living room couch isn't the greatest idea. 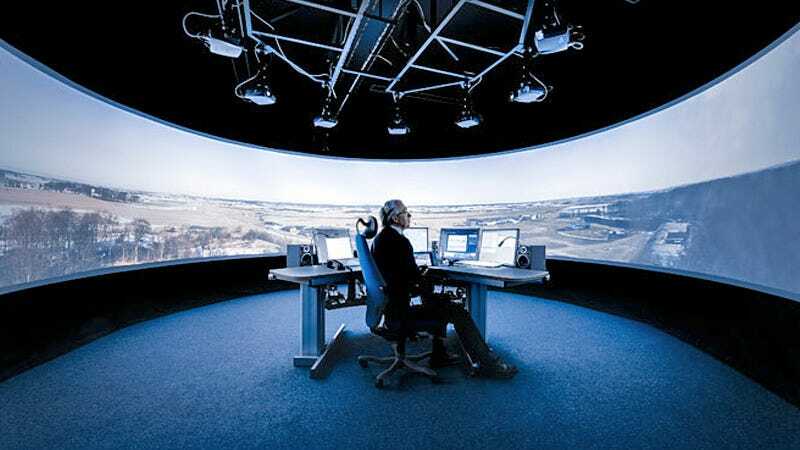 But that's exactly what Saab's new remote air traffic control towers will allow. Some day ATC crews won't have to be anywhere near an airport to do their job. At the moment, in airports all over the world, air traffic controllers sit perched in towers high above the tarmac, keeping an eye on planes on the ground and in the air. But building a tower is expensive—at least building one large enough to house people. So Saab has proposed a considerably simpler structure supporting an elevated platform filled with video cameras that constantly capture a full 360-degree image of the airport. That data, as well as feeds from a controllable zoom camera, can then be fed to a remote location where the video can be projected onto screens surrounding ATC crews.